Synchronous motor and induction motor are the most widely used types of AC motor. Construction of a synchronous motor is similar to an alternator (AC generator). A same synchronous machine can be used as a synchronous motor or as an alternator. Synchronous motors are available in a wide range, generally rated between 150kW to 15MW with speeds ranging from 150 to 1800 rpm. The construction of a synchronous motor (with salient pole rotor) is as shown in the figure at left. Just like any other motor, it consists of a stator and a rotor. The stator core is constructed with thin silicon lamination and insulated by a surface coating, to minimize the eddy current and hysteresis losses. The stator has axial slots inside, in which three phase stator winding is placed. The stator is wound with a three phase winding for a specific number of poles equal to the rotor poles. The rotor in synchronous motors is mostly of salient pole type. DC supply is given to the rotor winding via slip-rings. The direct current excites the rotor winding and creates electromagnetic poles. In some cases permanent magnets can also be used. The figure above illustrates the construction of a synchronous motor very briefly. The stator is wound for the similar number of poles as that of rotor, and fed with three phase AC supply. 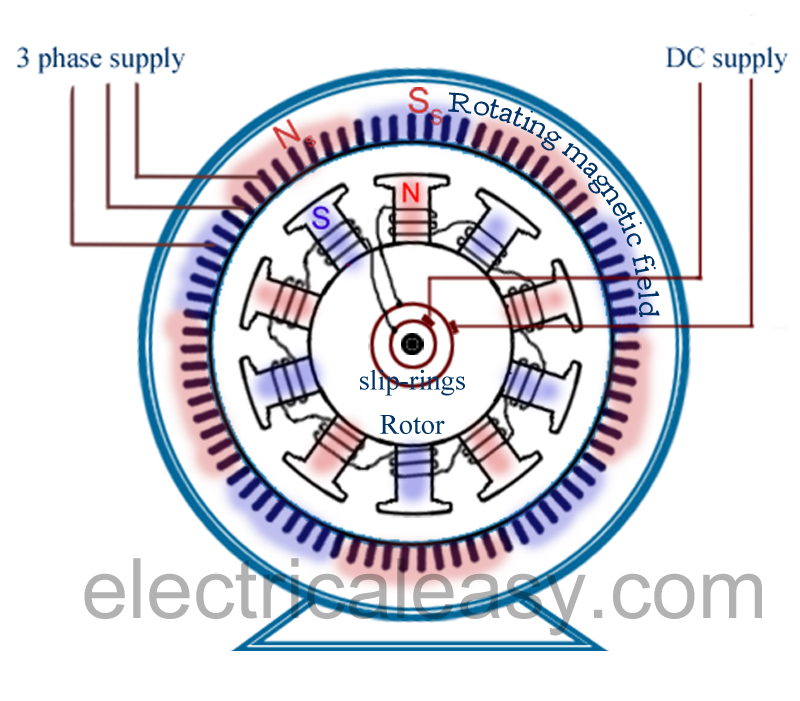 The 3 phase AC supply produces rotating magnetic field in stator. The rotor winding is fed with DC supply which magnetizes the rotor. Consider a two pole synchronous machine as shown in figure below. Now, the stator poles are revolving with synchronous speed (lets say clockwise). If the rotor position is such that, N pole of the rotor is near the N pole of the stator (as shown in first schematic of above figure), then the poles of the stator and rotor will repel each other, and the torque produced will be anticlockwise. The stator poles are rotating with synchronous speed, and they rotate around very fast and interchange their position. But at this very soon, rotor can not rotate with the same angle (due to inertia), and the next position will be likely the second schematic in above figure. In this case, poles of the stator will attract the poles of rotor, and the torque produced will be clockwise. Hence, the rotor will undergo to a rapidly reversing torque, and the motor will not start. But, if the rotor is rotated upto the synchronous speed of the stator by means of an external force (in the direction of revolving field of the stator), and the rotor field is excited near the synchronous speed, the poles of stator will keep attracting the opposite poles of the rotor (as the rotor is also, now, rotating with it and the position of the poles will be similar throughout the cycle). Now, the rotor will undergo unidirectional torque. 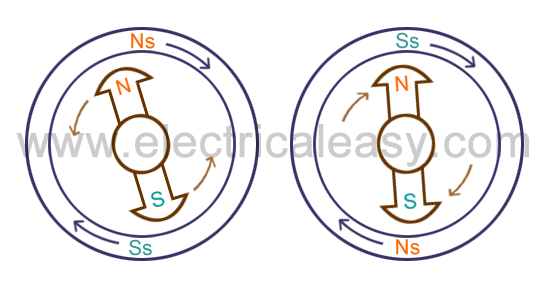 The opposite poles of the stator and rotor will get locked with each other, and the rotor will rotate at the synchronous speed. Synchronous motor will run either at synchronous speed or will not run at all. Synchronous motors are not self starting. They need some external force to bring them near to the synchronous speed. They can operate under any power factor, lagging as well as leading. Hence, synchronous motors can be used for power factor improvement. As synchronous motor is capable of operating under either leading and lagging power factor, it can be used for power factor improvement. A synchronous motor under no-load with leading power factor is connected in power system where static capacitors can not be used. It is used where high power at low speed is required. Such as rolling mills, chippers, mixers, pumps, pumps, compressor etc.